As you may or may not have heard, Griffins Green's is under new ownership and will be operating as Stone Creek Golf Club beginning in the spring of 2016. We have some exciting plans in the works for the near future. We hope you will join us this coming year as we get the ball rolling on our new endeavor. As new golf course owners, our mission is to simply "grow the game of golf". We intend to improve the golfing experience as a result of refining the golf course, improving golf related services such as handicapping, and adding multiple golf amenities as we grow. The short-term plan is to provide a wellmanicured golf course that is inviting to players of all ability levels. The mid-range plan is to design a welcoming clubhouse for all to enjoy. The longer-range plan is the addition of a practice area, where certified instructors will work with you to improve your game. 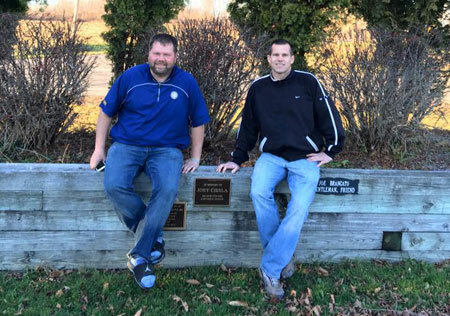 We are two local, life-long friends who met and grew up on the golf course and understand the importance of continuing the tradition the Griffin family began over 40-years ago. One has been a certified PGA golf professional with almost two decades of experience. One has been in the field of education for the same time frame. What we share is a passion for teaching and improving those we work with. We are both looking forward to carrying over our past experiences and evolving what has been a great place to be over the past decades. We encourage your feedback as we continue to plan for our upcoming projects. Feedback forms will be sent out via email over the next few weeks. Please provide us with your thoughts to help us best meet your needs as we begin this exciting endeavor. Attached is the 2016 membership application for your consideration. If interested simply fill out the application and submit to the return address with form of payment to secure your membership in 2016. Do not hesitate to contact us with any membership related questions. You may reach us at any time at the below provided information. We look forward to working with you as we build the exceptional golf experience, together. We can be reached at 315-343-2996 or email us at scgc18@gmail.com.